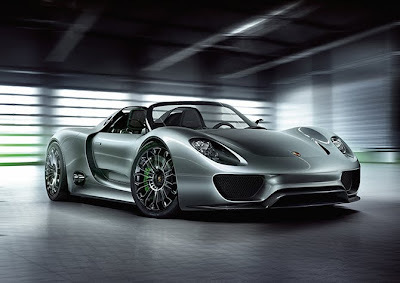 Germany's Spiegel Auto reports Wolfgang Dürheimer, Executive Vice President of Research and Development at Porsche AG, admits Porsche have designed the 918 Spyder hybrid sportscar to take advantage of European fuel efficiency regulation loopholes. That would explain why the 918 Spyder has an EV mode range of just 25 km (16 mile), as this is the minimum standard set in regulations for electric cars in Europe. Or as Dürheimer puts it: "We read a regulation and build the car accordingly." As it happens, a 25km range is just enough to pass the European fuel efficiency test, thereby qualifying the Porsche 918 Spyder as a "3-liter car" (3L/100km or 78mpg), allowing Porsche customers to drive straight through the most favorable automotive regulation loopholes as they power down the autobahn in their 320 km/h (198 mph) roadster powered by a high-revving V8 developing more than 500 horsepower.